If you’re in the habit of purchasing CDs and DVDs ‐ and who isn’t these days ‐ then you may already be familiar with how effective good media display can really be. A wonderfully executed POP display design draws the eye straight toward it. Customers who came to the store specifically to pick up that item are able to find it more effectively. Customers who happened to be there for some other purpose still notice the display and stand a good chance of at least wandering over to take a closer look. In a way, your choice of display options for your company’s media products can really make a massive difference in how your marketing campaign goes overall. It’s a simple equation. Engage the customer, get them interested in your product, and you make money. With each sale and each successful engagement, you facilitate the growth of your brand overall. The right display choices have the power to change a customer’s mind about a product and in some cases, they can really be the determining factor in regards to whether or not that same customer decides to purchase an item… or spare their budget in these trying economic times by putting it back. The thing is you can often judge a book by its cover and many consumers often do. Your media displays are your chance to tip the balance in your favor and convince people that they need your product. The benefits of dynamic, effective displays go far beyond connecting with your customers as well. It’s also important to connect with the retail outlets responsible for displaying it. Attractive POP designs make the retailer look good. A smart design choice can mean the difference between a particular store placing your product front and centerâ€¦ or hiding it in the back to avoid embarrassment. Creating media displays that really pop is a job best left to professionals if you’re serious about achieving real results. Here at Avante, we have the experience level, the creative drive, and the design chops to deliver the profits you’re looking for. Plus, we do it in a way that’s economical, user-friendly, and convenient! Our entire production process from start to finish is handled in-house to ensure consistent, quality results. From the initial design process to the printing itself, we do it all! Minimum production requirements are always kept low for your convenience. Order as few as 50 items if that’s what your project calls for! Since everything we produce comes factory direct to you, you’re guaranteed the best in quality control… always. We’re proud of the way we provide top-notch, professional services at prices that won’t destroy your bottom line. Don’t worry about shipping either! We flat-package everything to ensure that your order is courier-friendly and delivered in a timely manner. 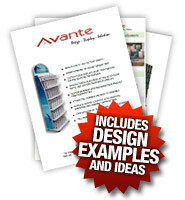 When you trust Avante to make your media displays everything you ever dreamed of and more, you come out on top. Let us make the difference for you today! To find out more about our Media POP Displays please click the link to request a Brochure.